Laurier is among RECODE’s round one funding recipients. Read on below to learn more about social innovation and social entrepreneurship activities and programs happening on Laurier’s campuses. Read WLU’s Letter of Intent for RECODE’s round one funding. In the spring of 2016, Laurier was named a “Changemaker Campus” by Ashoka U — a prestigious designation signifying Laurier’s role as a global leader in social entrepreneurship and social innovation education. To support students who are looking for a meaningful and well-rounded university experience, Laurier takes an “integrated and engaged” approach to education that links academic and experiential learning, while also “instilling the courage to engage and challenge the world in all its complexity.” From co-op programs to community service learning, Laurier provides a wide range of innovative learning opportunities for students. Below are some of the initiatives that helped them earn the Changemaker Campus designation. The Schlegel Centre for Entrepreneurship and Social Innovation is inspired by the vital role entrepreneurs play in the Canadian economy, and is dedicated to enhancing academic research in entrepreneurship and building and supporting entrepreneurship and social innovation in the Laurier community. It serves as the umbrella organization for Laurier’s social innovation and entrepreneurial offerings. Launched in 2015, Laurier’s Social Innovation and Venture Creation (SIVC) initiative builds on the Social Entrepreneurship Academic Option and several student clubs and groups that formed around the vision and goal of influencing positive social change. The SIVC team is small but mighty, and works in collaboration with a large network of partners to facilitate and drive social innovation and social entrepreneurship activities across Laurier campuses and within the wider community. Other approaches to sustainably improve or transform our social sphere for the better (e.g. advocacy, activism, policy work, knowledge sharing, etc.). 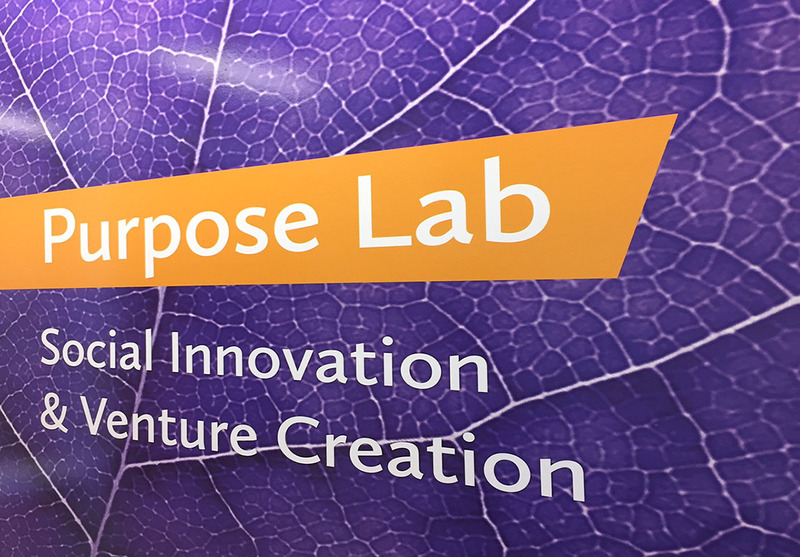 An initiative of SIVC, the Purpose Lab exists as the epicentre of student driven social innovation on Laurier’s Waterloo campus. The Lab provides collaboration space for students, faculty and staff to work together on social innovation projects. Students from all faculties and years are welcome to collaborate and ideate their passions and interests. Run by the Schlegel Centre for Entrepreneurship and Social Innovation, LaunchPad provides support, mentorship and resources (finance, marketing, accounting and technology) to start-ups founded by Laurier students, alumni and community members at the Waterloo and Brantford campuses. Offered across all Laurier faculties and campuses, LaunchPad encourages students, faculty, staff, alumni, and members of the community to collaborate and share venture-creation knowledge. Start@SIVC is part of the Ontario Social Impact Voucher (OSIV) program. Eligible social entrepreneurs and social enterprises can receive a $3,000 training voucher to access OSIV programs. Laurier’s Start@SIVC program offers a combination of in-person and online modules through our Waterloo and Brantford campuses that provide targeted support for female and non-traditional learners ready to start or scale a social enterprise. The program differs from traditional entrepreneurship training by building key business skills while placing equal emphasis on the personal and professional growth of the entrepreneur so that they are best able to capitalize on opportunities and achieve success. The Neighbourhood Changemaker Program is designed to encourage individuals that live and work in the Brantford community to come together in a safe and welcoming space to brainstorm ways to make their communities better. Maybe you have a great idea about how to help seniors stay active in the community or you want to start a program that would encourage people of different cultures to talk together in a safe and welcoming space. Perhaps you have a great idea about how to improve recycling rates, or help more young people stay in school, or help new mothers get connected. Or maybe you are just committed to helping make Brantford the best city it can be and you don’t have a specific project idea just yet. The possibilities are endless. The Community Engagement Option is a unique partnership with The Working Centre in Kitchener that provides experiential learning opportunities designed to help students explore the concepts of social inclusion, local democracy, and community enterprise. The Social Entrepreneurship Option is the first Canadian undergraduate social entrepreneurship program grounded in the liberal arts. It was constructed with the ideal student in mind — someone who is intellectually and personally courageous, cares deeply about the world, and considers their undergraduate education to be a vital stage in their lifelong learning; and someone who wants both depth in their specialization of choice, and breadth. Inspired by CityStudio Vancouver, Laurier is partnering with local municipalities to launch CityStudio Waterloo and CityStudio Brantford on the Waterloo and Brantford campuses. Beginning in the 2016-2017 academic year, the CityStudio pilot project will see third and fourth year students working alongside the city of Waterloo and city of Brantford staff and other stakeholders to create, design, launch and test projects in the Waterloo and Brantford communities. Laurier’s social innovation and social entrepreneurship initiatives are led by a dedicated group of individuals from across the university and includes students, alumni, staff and faculty. Connect with the Schlegel Centre team and SIVC team. To learn more about Laurier’s on campus activities and programs, visit the Schlegel Centre for Entrepreneurship and Social Innovation and sivclaurier.ca. Waterloo Chronicle, November 9, 2016. The Waterloo Region Record, May 10, 2016. Wilfrid Laurier University News, May 10, 2016. Huffington Post, February 9, 2016. The Globe and Mail, July 17, 2015.